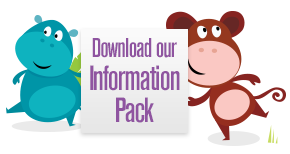 Firstly, download an information pack to learn more about what we can offer, and if you are interested in our nursery, make an appointment to come and visit us. We would then recommend completing a booking form to register your interest. Places at our nursery are in high demand, so we encourage you to register with us at least 6 to 9 months before you need a place. This will help to ensure that you can choose the days that you would like your child to spend with us. We require a £50 retainer to guarantee your child’s place, but this is deducted from your fees in the first month. Around 4 weeks before your child begins attending, Hayley will get in touch to arrange introductory sessions at the nursery. These will give you the opportunity to share any important details with us, and will also give your child the chance to explore their new environment. These sessions are offered in two lots of 2 hours and one lot of 3 hours, and are free of charge. You will need to supply us with nappies, wipes and any other changing essentials if your child is in nappies. We change nappies a minimum of three times a day. We always recommend that children have a change of clothes to hand, and we also recommend plenty of changes of underwear for children who are toilet training. Don’t forget any dummy or comforter that your child might need throughout the day. We supply cows / soya milk, but you will need to supply formula if your child requires it, as well as baby rice if necessary. Once children have been weaned, we provide all meals. Fees are due on the first of the month in advance, or if your child starts with us after the first, fees are due within a week of beginning. We accept payment via standing order, cheque or cash, and we also accept childcare vouchers. Visit the HMRC website here to see if you can claim childcare vouchers or tax credits to fund your child’s nursery fees; http://www.hmrc.gov.uk/calcs/ccin.htm. Excellent! I'm confident my daughter is well looked after whilst we are at work. I would not hesitate in recommending Whickham Cottage to anyone.